With unparalleled artistry and enduring vigor, the Juilliard String Quartet continues to inspire audiences around the world. Founded in 1946 and hailed by the Boston Globe as “the most important American quartet in history,” the Juilliard draws on a deep and vital engagement to the classics, while embracing the mission of championing new works, a vibrant combination of the familiar and the daring. Each performance of the Juilliard Quartet is a unique experience, bringing together the four members’ profound understanding, total commitment, and unceasing curiosity in sharing the wonders of the string quartet literature. Ms. Areta Zhulla joins the Juilliard Quartet as first violinist beginning this 2018-19 season which includes concerts in Hong Kong, Singapore, Shanghai, London, Oslo, Athens, Vancouver, Toronto and New York, with many return engagements all over the USA. The season will also introduce a newly commissioned String Quartet by the wonderful young composer, Lembit Beecher, and some piano quintet collaborations with the celebrated Marc-André Hamelin. Having recently celebrated its 70th anniversary, the Juilliard String Quartet marked the 2017-18 season with return appearances in Seattle, Santa Barbara, Pasadena, Memphis, Raleigh, Houston, Amsterdam, and Copenhagen. It continued its acclaimed annual performances in Detroit and Philadelphia, along with numerous concerts at home in New York City, including appearances at Lincoln Center and Town Hall. Adding to its celebrated discography, the JSQ released a new album featuring the world premiere recording of Mario Davidovsky’s Fragments (2016), together with Beethoven Quartet Op. 95 and Bartók Quartet No. 1, which will shortly be issued on the SONY label. Highlights of concert programming throughout the 2017-18 season included other visionary works by Beethoven, Bartók, and Dvořák, as well as James MacMillan’s haunting and evocative Quartet No. 2, Why Is This Night Different? (1998). 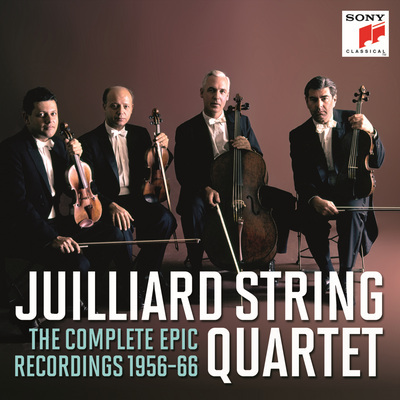 Celebrating one of the great collaborative relationships in American music, Sony Classical’s reissue of the Juilliard Quartet’s landmark recordings of the first four Elliott Carter String Quartets together with the 2013 recording of the Carter Quartet No. 5 traces a remarkable period in the evolution of both the composer and the ensemble. The quartet’s recordings of the Bartók and Schoenberg Quartets, as well as those of Debussy, Ravel and Beethoven, have won Grammy Awards, and in 2011 the JSQ became the first classical music ensemble to receive a lifetime achievement award from the National Academy of Recording Arts and Sciences. Devoted master teachers, the members of the Juilliard String Quartet offer classes and open rehearsals when on tour. The JSQ is string quartet in residence at Juilliard and its members are all sought-after teachers on the string and chamber music faculties. Each May, they host the five-day internationally recognized Juilliard String Quartet Seminar. During the summer, the JSQ works closely on string quartet repertoire with students at the Tanglewood Music Center.